As you may or may not have garnered from a recent post, I am working on designing my very own board game. I started this project in high school, and even got it to a point where I submitted a proposal to Mayfair games. Apparently the proposal was well-written, because I received a response requesting to see my rules. Unfortunately (as is very clear to me now) those rules were sloppy, overcomplicated, and just not very fun. I took a break from the project for several years, but I recently rediscovered the rules and have been thinking about them for a while in the back of my mind. Then, just a few weeks ago, I had an epiphone and figured out a completely new mechanic for the game that was significantly simpler and more-fun-sounding. So, my work on the project restarted, and i’ve made loads of progress since then. In working on this project and attempting to sort out all my old poorly-formed rules, and rewrite them completely, I realized how much I’ve learned about gaming. As I’ve struggled with ironing out the remaining kinks in gameplay, I’ve been able to figure out several key items to get good rulesets. If you’re thinking on designing a game of your own, this post is for you. My original ruleset involved units with populations and attack values and upgrades that would involve adding up multiple 3-digit numbers (like 451 + 244+ 550) and multiplying dice rolls and comparing results and subtracting… I’m boring myself just thinking about it. Though I wanted to make an epic feel, I ended up making boring and essentially unplayable combat mechanics. My newer mechanics are much simpler, however as I work on the rest of the rules I have to keep checking myself with ‘special conditions.’ If every rule has an exception, that exception better be clarified on a card or something like that in gameplay, because its too much to remember every special case. And then you have to ask yourself, does this special case really enhance the game, or is it just an idea that i’m throwing in for kicks? In my original design, you had to purchase cards, and obviously the more powerful cards were more expensive. But I essentially just estimated values for cost after assigning attack, defense, and special ability values. While easier to do, it would almost certainly have created Units that were far too cheap or expensive. I now have an algorithm i developed to calculate the cost of each card specifically based on its properties. Looking back at my previous rules, I realized that there wasn’t much to encourage the players from just sitting in defensable positions waiting for the other players to come and attack them. The game could essentially grind to a halt if no one wanted to sacrifice their position just to push the game forward. There were just too many resources and cards and space available. Games should force players to step on each others toes. Even in Dominion, which involves less direct player interaction than most many games, still forces the players together since they all draw from the same resources and action cards. Every action or point or treasure card a player picks up prevents another player from picking up that same card, and it also moves everything closer to the endgame. In settlers, the map has space for everyone, but limits it so that no matter what you, you will run into other player’s territory and be forced to deal with that. Many games allow trading, forcing you to deal with other player’s own desires and whims. Something I didn’t even realize before I really got into this current project is the importance of consistent Terminology. If, in the rules, I sometimes use the word Cities, and sometimes Fortresses, but referring to the same thing, that causes confusion even before the game starts. Having clear, defined terminology also allows you to condense your rules, as you don’t have to clarify what you mean every time you say something. I once had an argument with Bryan about a card he was trying to play in Cosmic Encounter. The card said he could use it as “Offense Only” but he was an Offensive Ally. Bryan argued that as an Offensive Ally, he should be considered on the Offense. Fortunately, the rulebook was clear that Offense referred to the Main Player that was attacking, which is different than Offensive Ally. Similarly, Dominion uses keywords Action, Card, Gain, Trash, and Buy to greatly reduce the need for complex descriptions on their cards. In my original rulebook, you had to destroy all the other players before they destroyed you. Looking back, I realize that this could not only create pointlessly long, drawn-out games, but it also can eliminate players long before the game is actually finished. This is a key element of Monopoly and Risk that I very much dislike. Games need clear victory conditions that stretch the players, but without dragging the length of the gameplay into boredom. These conditions should also encourage players to utilize all aspects of the game to get there. One of the great things about Catan’s Victory Point shindig is that you truly have to stretch your resources and diversify your efforts to reach the required 10 points. (I have an upcoming blog post entirely about Catan, so I’ll go into more detail.) You generally shouldn’t be able to win a game simply by sitting back and watching things happen, or ignoring a significant aspect of the game. Many games share similar mechanics. So why should anyone play your game if its exactly the same as another? Give us a fun story, or a twist to the gameplay that spices things up a little. This hook can also be used to take really simple mechanics and make them interesting. If your game involves rolling dice and moving that many squares forward, and then you get money or something bad happens based on the square you land on, that’s kind of boring. Take Candyland.. you draw a card, you move forward. Sometimes you have move back but you really have no control over that. It’s a great game for 4-year-olds but not for adults. 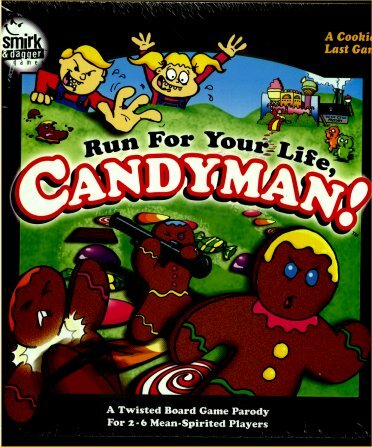 However… “Run for your Life Candyman” takes the same mechanics of drawing a colorful card that tells you where to move, however it adds the ‘hook’ that you can attack (and rip apart) the other players gingerbread men. Part of the hook is that each player has a sheet with a picture of their gingerbread person on it, and if you destroy a limb, you get to literally tear it off. It’s great fun. Any of you out there thought about designing your own game? Got some great ideas for modifications to other games? Other ideas on things that are important when working on a game’s rules? Let me know. Don’t forget to tell your friends. And subscribe. Next Article It’s a Christmas gift list! I’ve worked on a number of games since college but haven’t completed any of them yet. I probably have about 4 that are playable with written rules but I’m not happy enough with any of them to consider doing anything with them. Hopefully some day I’ll actually finish one of them. I’d be happy to look at your rules at some point or even play it with you and some other people if we get the chance. Maybe we can do a game weekend some time. Also I’d love to look at your rules once you get them to the point where you like them. I’ve definitely run into the things that you listed especially 1 (Don’t over complicate things), 3 (Player interaction), and 5 (Victory conditions). The first (over complicating) I have probably had the most issues with as I discovered that people don’t always enjoy some mechanics, especially math heavy ones as you mentioned, that I find to be interesting, intuitive, and fun. This is where having other people test out your game is a huge help since you can see which rules may require some tweaking or rehauling to get to the point where the are enjoyable. The others points I mostly had in mind going into the game design process, especially 6 (A good ‘hook’) as I like to come up with unique mechanics that would make my games unique and build the game around it. Number 4 (Terminology) can probably also expand to include iconography although it may be branching more into game design at that point. Using Dominion again as an example, there are times where icons (such as coins and VP symbols) are used to make the cards easy to read and understand quickly and from a distance. Icons are extremely common in games that I enjoy and knowing when to use icons instead of text can make a big difference. One of my favorite games, Race for the Galaxy, uses icons very heavily and is both praised and criticized for this. It can partially be a learning style preference (some people simply prefer words over icons) but I think icons, even limited, can vastly improve game design. From my own design experience, the main thing that I would add to your list would be intuitiveness. Players are a lot more likely to pick up and understand rules that make sense in the context of the game, even if they are complicated. Take Agricola, a farming simulation board game, as an example. This is a fairly complicated game with a lot of rules but they all make sense and fit very naturally into the theme. Every year you have to feed your family and there are a number of different options that let you gain food (fishing, baking bread from grain, slaughtering animals) which you can easily understand why/how they would get you food and why some would give you more or less than others. There are also a number of different resources that you are gathering along with food to do various things to improve your farm and it makes sense that gathering a certain resource would lead to specific improvements (wood can build fences, clay can build an oven, stone can build a well, grain and vegetables can be planted, among other uses). Settlers of Catan is an interesting example of a game that I don’t think completely follows this. As far as the resources go I didn’t follow why I need certain resources to build what. Yes there is a player aid to help you learn what you need and after a while you’ll know without checking but why do I need a grain, sheep, and ore to get a development card or 2 wheat and 3 ore to upgrade to a city? I’m not sure so I need to look at the reference card to double check and that’s unfortunate. A lot of the game is very intuitive, and this is really a minor gripe, but there are some details like build cost that I don’t really get. Snuggles, you just described something that’s bugged me about settlers since the first time I played it, although I don’t think I could have articulated it until now. I’ve never understood why the resources are what they are–wheat could be called corn and it wouldn’t change a single thing–and what they add up to doesn’t make sense either. Also, the colors used for sheep and wood just blend together to my eyes. All those things combine to create a low level of annoyance and anxiety for me. Wolfie, I’d love to help you playtest too when you get it to the point where you’re happy to show it to people. I don’t really have many plans between January and April so I’m sure we can pick a weekend in there to do it. Otherwise I’ll probably be free for most of the summer since Hannah will start her residency by then. Some weekends are worse than others for Hannah right now so we can probably start looking into specific dates once she gets her calendar for next semester. I also have a board game convention that my game group puts on every year in late February, it’s basically just three straight days of playing games and is totally awesome. If you’re interested in coming down to Indy for it I can send you more details. It would be well worth the trip. ah hah, chris, the whole “Calling it corn and it wouldn’t change a thing” statement made me think of a short, relatively boring story about that from Gencon, which I will turn into a blogpost. also snugs please send me more details on your convention because it sounds nifty.